Kellerkind... Beates Paradies: Danke Caro! Noch mal einen dicken Knutscher für dich! Ich liebe dieses Set! Dieses Mädel musste ich einfach haben... kennt ihr das? Sweet Card, love the pink and black. Thanks for joining us for Lady Anne's Stamp Challenge. 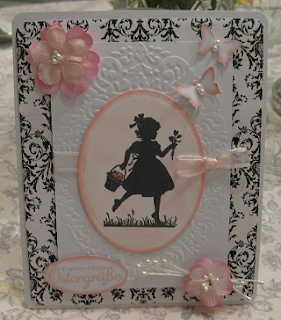 Beautiful feminine card, especially love the silhouette image. Thanks for joining us this week over at LRW. ganz lieben dank für deine teilnahme bei ruby's rainbow challenges! This is such a pretty card. I really like your design and image. Thanks for joining us at THE PAPER SHELTER this week. Please join us again next time.